The full potential of proteins in research and therapeutic applications is hampered by their fragility. To address this issue, Cell Guidance Systems is developing PODS®, a technology that captures nascent proteins within a protein crystal shell. This shell forms within the production cell and stabilizes the protein during the manufacturing process and subsequent storage. When used in-vitro or in-vivo, these crystals provide sustained protein release. PODS® technology is transforming both the research and therapeutic value of proteins. PODS® crystals are generated in cells in which the polyhedrin protein is expressed at high levels under the control of the polyhedrin promoter. PODS® co-crystals are formed when a second protein, also under the control of a polyhedrin promoter, is co-expressed. This second protein is termed the active, or cargo, protein. The active protein is tagged with a short peptide sequence which causes the active protein to bind to the growing polyhedrin crystal. As the cubic crystal continues to grow, the active protein becomes encased. Active proteins are incorporated into PODS® crystals when co-expressed with the polyhedrin protein. PODS® growth factors consist of two proteins: An active protein (e.g. a growth factor) is encased within a polyhedrin microcrystal actually inside the insect expression cell to form a co-crystal. This polyhedrin casing protects the active protein during the purification of the growth factor ensuring the growth factor is not denatured and is correctly folded and functional. The co-crystal provides stability so the PODS® growth factor can be stored at 4°C or 25°C, even in liquid. Finally, the PODS® co-crystal provides a sustained protein release mechanism so cells stay in the optimal concentration zone for longer; no toxic high start and no ineffective end. PODS® crystals offer a very simple approach to micropatterning and generating physiologically relevant protein gradients. An SEM image showing a granular field of PODS® crystals containing neurotrophic growth factors. 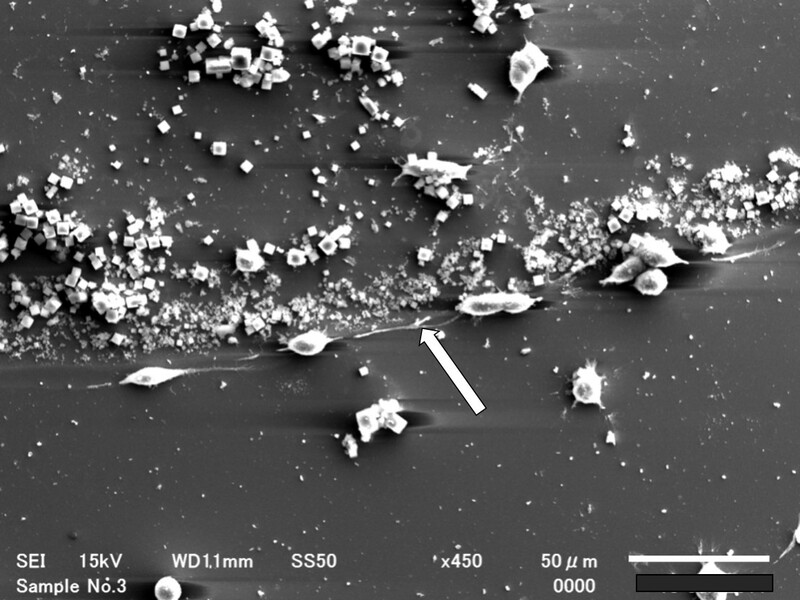 The crystals have been applied to the culture surface for micropatterning using a pipette. PC12 neuronal precursor cells were subsequently plated. The cultures were incubated under static conditions for 96 hours. During this time, the PODS®crystals secrete their cargo creating a uniform, high concentration of growth factor over the crystals with a gradient around the edge. PC12 cells move up the gradient towards the edge of the crystal field. At close magnification, it is possible to see neurites (arrowed) extending from the neuronal cells. These neurites are perpendicular to the gradient formed by micrpatterning and connect with the neighboring cell allowing the neuronal cells to form a single connected chain. Data Courtesy of Prof Hajime Mori, Kyoto Institute of Technology. How big are PODS® crystals? PODS® crystals are cubic and typically 0.3-6 microns in size with a modal size of 1-2 microns. During the manufacturing process, some PODS® co-crystals may fracture resulting in smaller PODS® crystal fragments. What is a PODS® crystal's buoyant density? PODS® co-crystals are heavier than water and will settle on the surface of a culture vessel. Care should be taken when aliquoting since PODS® crystals will sink to the bottom of a tube within a few minutes. The majority of PODS® crystals will remain in suspension for up to 60 min in a 20% glucose solution (or a solution of similar density). How stable are PODS® crystals? We have tested a variety of conditions to assess their impact on the integrity of PODS® crystals. PODS® crystals are stable in high temperatures and even appear intact after boiling for 1 hour. They are highly stable when stored in solutions between pH 6-8. Above pH 10, PODS® crystals lose their stability and dissolve rapidly (in a few hours). PODS® crystals are stable in standard cell culturing temperatures for extended periods of time (> 10 days). How is the active protein released? In addition to pH, PODS® protein crystals are broken down by solutions containing proteases. Proteases may be derived from components of the solution (e.g. serum) or secreted by cells. Therefore the culture system affects the amount of growth factor available in solution. In contrast to gel-encapsulated proteins (using hydrogels such as PLGA) PODS® crystals do not produce an initial burst release of cargo proteins. For naked PODS® crystals in cell culture, peak release in once culture system has been shown to occur at day 2, then gradually diminishes. In other culture systems' peak availability may require a week to occur. Peak availability depends on a number of factors including the rate of protease release by cells and the inherent stability (half-life) of the cargo protein. Is it possible to modify the release profile? The release of active proteins into cell culture occurs over a period of 1-3 weeks. This release period can be extended if the PODS® crystals are combined with a scaffold, such as a collagen which acts as a barrier to protease activity. Will PODS® crystals adhere to plastics? PODS® crystals will adhere to untreated plastics and are therefore ideal for micro-patterning and scaffold functionalization. For sub-aliquoting, we recommend using low adherence plastics, such as low protein binding centrifuge tubes. Why are PODS® proteins sold by numbers of crystals? PODS® active proteins are incorporated into the polyhedrin crystal within the insect cell. Consequently, it is not possible to determine the amount of active protein that is present in a sample by measuring optical density. When PODS® crystals are expressed, both polyhedrin proteins and active proteins are expressed from within a single vector and both utilize the same promoter sequence. Therefore, the ratio of active to polyhedrin protein will be constant. The size distribution of PODS® crystals is also constant. Consequently, the number of crystals has been adopted as the unit of quantification for PODS®. It has been estimated that 50x106 PODS® crystals typically generates a peak concentration in the medium equivalent to 3.3 µg of standard recombinant protein. How many PODS® crystals should be used? PODS® crystals provide a depot of active proteins which are steadily secreted. 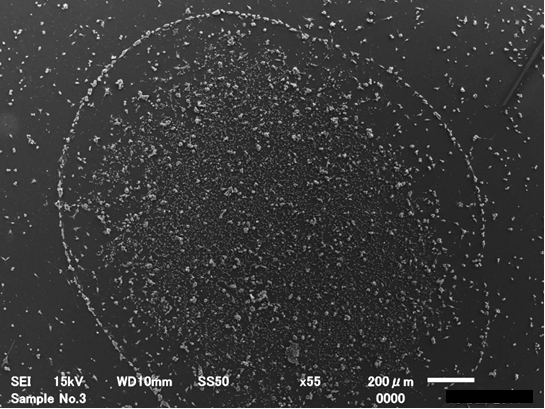 As stated above, in one experiment it has been estimated that the biological activity of 50x106 PODS® crystals generates the same peak dose as 3.3 µg of standard recombinant protein in a LIF-dependent mouse ESC culture system. However, at 5 days following the start of seeding the PODS™ crystals, more than 50% of these peak levels are still present in the culture system. Ultimately, the amount of PODS™ crystals that are optimal for a particular experiment should be determined empirically, using 50x 106 PODS® crystals equivalence to 3.3 µg of standard growth factor as a good starting point. How often should media and PODS® crystals be replaced in the culture system? The frequency of media change depends on (1) the speed with which nutrients are exhausted or degraded and (2) the speed with which toxic metabolites accumulate. In most cell culture systems, the stability of growth factors is an over-riding issue which drives media replenishment. However, particularly in cells with high levels of metabolic activity, other factors will eventually become important once the stability issue has been addressed. PODS® are isotropic crystals which do not refract light. However any cargo protein impacts on this property such that they will refract light. A large number of PODS® crystals may interfere with the generation of images using imaging techniques such as phase-contrast and may also interfere with any assay that utilizes the measurement of optical density. Can PODS® crystals have a physical impact on cell behavior? Physical features on a culture surface may impact the behaviour of certain cells, particularly at high densities. If PODS™ crystal topology is a concern, PODS® crystals may be incorporated into a hydrogel surface coating. Phagocytic cells (such as macrophages) may ingest PODS®. Custom made Matrigen™ Softwell plates (flat hydrogels of defined elasticity) containing PODS® crystals are available from Cell Guidance Systems. Do PODS® proteins have important post-translational modifications? PODS® crystals are made in insect cells. PODS™ active proteins, therefore, contain most of the post-translational modifications that are found in mammalian cells. For example, PODS® Wnt-3a, which requires palmitoylation and glycosylation for biological activity, has been shown to be functional. The polyhedrin protein has been tested many times in-vivo and, although antibodies are generated against polyhedrin, an obvious inflammatory response has not been observed. Lack of an inflammatory response for foreign proteins is not without precedent: silk fibroin protein from the silkworm B. mori is commonly used for surgical stitching and Botulinum toxin is widely injected in cosmetic procedures to reduce the appearance of wrinkles. Are PODS® proteins equivalent to standard growth factors? The stability of standard recombinant growth factors varies significantly. The most labile, such as FGF-1, have a half-life measured in minutes limiting their utility. 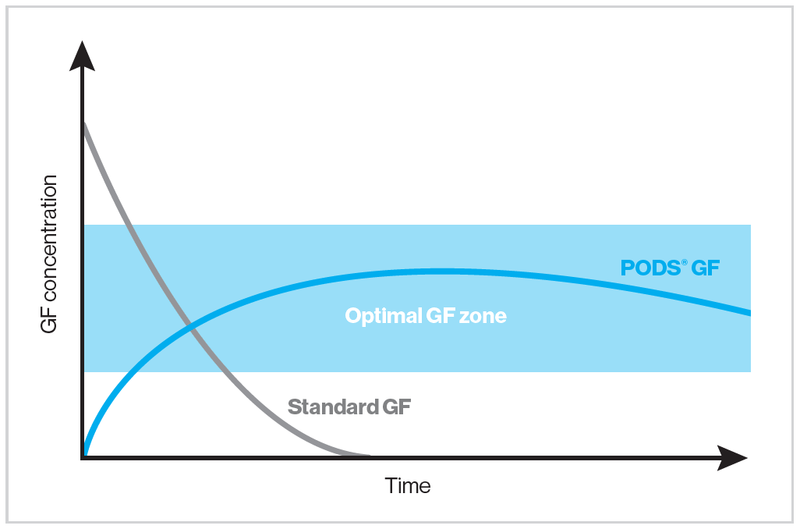 The stability of PODS® growth factors that are encased in PODS® crystals is much longer but once released will be the same as their standard recombinant counterparts. The amount of available growth factor in a culture system is a function of the speed of release from the crystal and the subsequent stability. In the first few hours of a culture containing only newly added PODS® crystals, there is little growth factor protein available for the cells. Significant amounts of growth factor protein are available after one day. The initial lag of protein availability may be corrected if necessary by adding a small amount of standard recombinant growth factor. We are interested in developing therapeutic applications, can you help us? We already have several therapeutic programs in place. Please contact us at info@cellgs.com if you plan to develop a therapeutic application.